Congratulations to coach Erik Spoelstra and the Miami Heat who beat the San Antonio Spurs 95-88 to win their second consecutive NBA championship. LeBron James was unstoppable last night in a must win Game 7 showdown that took place in Miami against the Spurs. James, named MVP, scored 37 points in addition to his 12 rebounds & teammate Dwayne Wade added 23 points and 10 rebounds to the total, and led the Miami Heat to a Heat repeat in one of the most exciting series that could have gone either way. 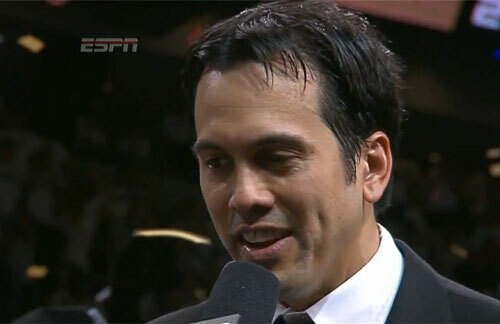 Photo shows Miami Heat Coach, Erik Spoelstra, speaking with the press after winning Game 7. Photo shows NBA legend, Bill Russell, presenting the MVP trophy to LeBron James after the Miami Heat won the 2013 NBA championship against the San Antonio Spurs on June 20, 2013. Watch video of the trophy presentation to the Miami Heat crowned 2013 NBA champions after beating the Spurs in an amazing 7-game series. 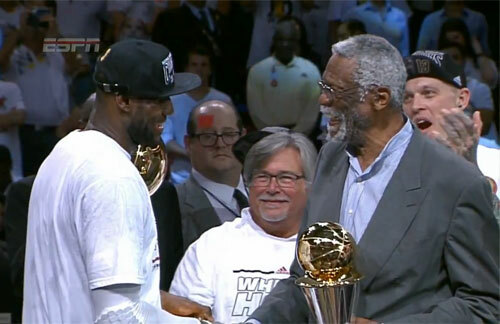 LeBron James is given the Finals MVP trophy from NBA legend Bill Russell. This is the Miami Heat’s third NBA title after winning the championship in 2006 and 2012. If you would like to book Miami Heat players like Dwayne Wade for a speaking engagement, autograph signing, guest appearance, product endorsement, celebrity golf tournament, marketing or PR campaign, charity fundraiser or special corporate event, you can request Dwayne Wade agent, speaker and appearance fees. For booking agent information on how to hire Dwayne Wade for appearances, call 1.855.503.5450.